This paper was presented at the conference in Bucharest, Romania. The aim of this paper is to present an overview of a research about the monitoring of the urban acoustic environment affordably and reliably, and investigating the potential use of Volunteered Geographic Information (VGI) for such applications in typical medium-sized cities. The quality of the soundscape in cities is a significant parameter that influences the percentage of population affected by noise and is a component of the “nuisance” indicator often used for the assessment of the urban environmental sustainability in Europe. However, limited attention has been given by planners to the acoustic environment of a city so far. In Greece, research on this issue and its representation at the city scale has been conducted only for a limited number of large cities, whereas in most of the cities and towns there is no available data. The aim of this paper is to present an overview of a research about the monitoring of the urban acoustic environment affordably and reliably, and investigating the potential use of Volunteered Geographic Information (VGI) for such applications in typical medium-sized cities. This research is conducted as part of the ongoing Sustainable Urban Mobility Plan projects (SUMP), aiming to improve the urban landscape, increase quality of life and transform cities into more compact and liveable urban cores. Once the urban design characteristics are listed by the experts, audio recordings are collected through crowdsourcing (using apps in smart phones) in several city spots, according to a grid-based sampling methodology. Then, a sound map is created using the Ordinary Kriging technique in GIS, while finally the collected noise data are imported in OpenStreetMap (OSM) by the volunteers. 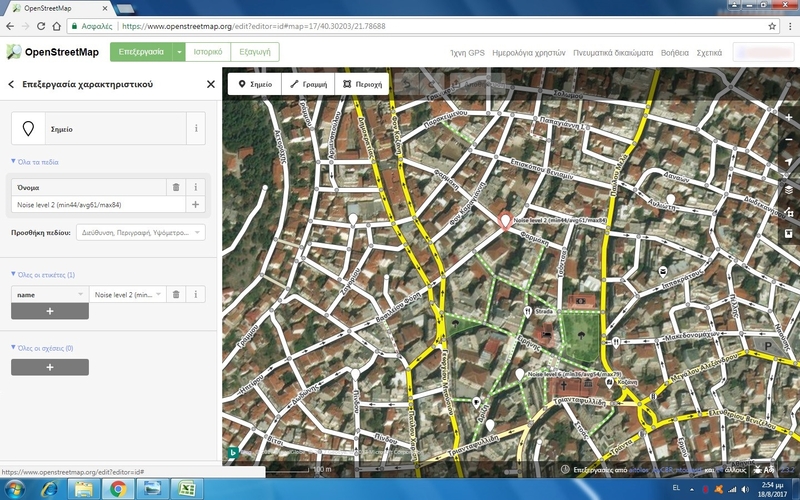 The methodology was tested in two Greek medium-sized city centers (Kozani and Drama). The soundscape data were then assessed by taking into consideration the European and national legislation about the urban acoustic environment as well as the various characteristics of each study area. As expected, results show that residents are exposed to high sound levels during the day. However, sound levels in car-free zones are considerably lower except from specific streets where motorcycles enter illegally (for delivery or freight purposes). 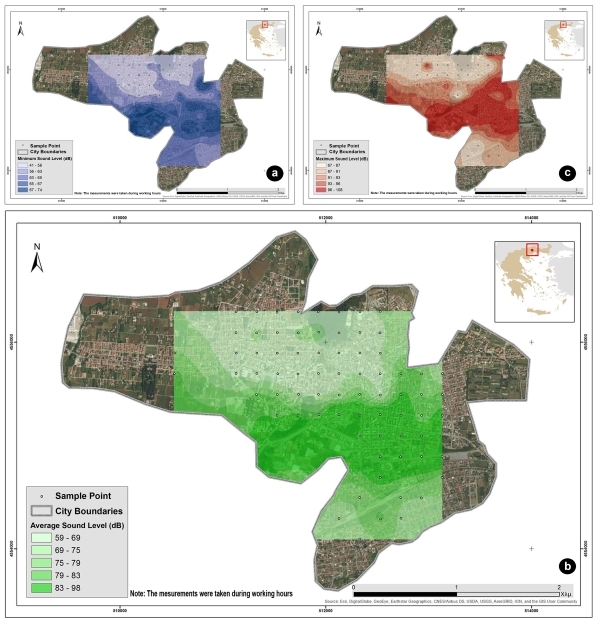 In overall, this research proved that there is a strong potential of using crowdsourcing techniques to collect noise data and monitor the soundscape reliably and affordably. It is crucial for the municipalities to engage citizens in participating to urban renewal projects in main streets as well as in vulnerable or sensitive city areas (i.e. neighborhoods, school zones) in order to raise awareness about noise pollution and create a better acoustic environment. Through these case studies, this paper points out that crowd sourced noise mapping may be utilized as a reliable tool for participatory planning. The paper provides considerations on how the proposed methodology may be further tested and improved. Over 50 years have passed since Murray Schafer studied the influence of the sonic environment on people. However, the term “soundscape”, which was used to explain this relationship (Rodriguez-Manzo, et.al., 2015; Schulte-Fortkamp and Jordan, 2016), is still up-to-date. Another contemporary issue has to do with the transformations of the soundscape. In contrast with the natural and urban environment, where the differentiations could be easily understandable through aerial photography techniques of remote sensing and mapping tools, the investigation of the changes that occur in the soundscape (Schaffer, 1993) is not easy due to the fact that, in many areas, mapping of the soundscape is not carried out although it constitutes a useful tool for the evaluation of buildings and urban areas (Schulte-Fortkamp and Jordan, 2016). The view of Maffei et.al. (2012) and Margaritis et.al. (2015), that the sonic environment does not consist of a significant parameter in the urban planning practice is well-founded even in Greece, where the only official mapping of the soundscape has been carried out between 2012-2016 only in specific cities, based on the 13586/724/2006 Joint Ministerial Decision (FEK B’ 384) that followed and embodied the European Directive 2002/49/ΕC (Vogiatzis and Remy, 2017), aimed at confronting high levels of noise in cities using common ways for all EU country members (Stoter, et.al., 2008; Licitra and Memoli, 2008). However, these mapping projects do not constitute a complete representation of the sonic environment, but only the environmental noise [Strategic Noise Maps (S.N.M) and Noise Action Plans(N.A.P.)] (Directive 2002/49/EC), which is only a parameter of the sonic environment according to Rodriguez-Manzo et.al.(2015). The interest in noise links to the fact that noise pollution is an essential problem in urban areas (Schweizer, et.al., 2011; Pödör and Révész, 2014; Pödör, et.al., 2015; Rodriguez-Manzo, et.al., 2015; Poslončec-Petrić, et.al., 2016; Pödör and Zentai, 2017). Indeed, Vasilev (2017) points out that the increase of noise levels (0,5-1,0 dBA) in cities is a reality. Regarding the measurements and monitoring of noise levels, different methodologies have been occasionally suggested. Such methodologies are: noise recordings, population surveys and interviews, soundwalks and noise mapping (Rodriguez-Manzo, et.al., 2015; Schulte-Fortkamp and Jordan, 2016). Even for individual procedures, different techniques have been proposed. In noise mapping, for instance, different methods and tools can be used (Bennett et.al., 2010; Schulte-Fortkamp and Jordan,2016) for data collection and representation. Indeed, according to Schulte-Fortkamp and Jordan (2016), the natural conditions of a soundscape can be measured by using binaural recording devices or microphone arrays. Maps can be created by algorithms that produce maps based on estimations or by using measured data (Cho, et.al., 2007; Stoter, et.al., 2008). In practice, due to high cost (Schweizer, et.al., 2011), local authorities choose to monitor soundscape by placing sensors in specific points, that usually do not cover the total surface of a city. According to Aiello et.al. (2016), this particular method is a result of the European Directive 2002/49/ΕC, which requires European countries to monitor noise levels produced by specific sources (road traffic, railways, airports and industry). The same researchers (Aiello et.al., 2016) point out that, due to many deficiencies observed, epidemiological models are occasionally used for estimating noise levels. These models are based on samples of small population or data derived from smartphones or social media, in order to decrease the cost of such research. The research of Podor and Revesz (2014), Podor et al. (2015) and Podor and Zentai (2017) converge to the same opinion and argue that it is fundamental to use data derived from crowdsensoring and crowdsourcing for monitoring noise levels. That is why, according to the European Directive 2002/49/ΕC, noise maps must be renewed every 5 years, a task that is restricted by the economic conditions of certain countries such as Hungary, to which these researches are referred, if the used methods are the conventional ones. During recent years, the European Commission has financed projects that are based on crowdsourcing in which people have been used as “sensors” (Podor, et.al., 2015). In these projects, people carry their smartphones that are personal devices equipped with applications that provide data without cost (Schweizer, et.al., 2011). According to Schweizer, et.al. 2011, smartphones constitute ideal platforms for environmental data measurements as, beyond sound levels that are recorded by the microphone which is incorporated in the device, they are also equipped with GPS providing spatial information at the same time. The advantages of smartphones is that they can be used in order for researchers to achieve goals like: (a) low-cost data collection process, (b) citizens’ participation for improving the quality of urban environment and (c) constant monitoring of the soundscape, when people use applications providing real time data. From the above can be concluded that participation of people consists a significant process on which this paper focuses. The reasons are: (a) volunteered participation is a necessary parameter in order to collect data with low-cost budget (Schulte-Fortkamp and Jordan, 2016), (b) volunteered participation has a great additional value as it constitutes a process that increases the geospatial maturity of the society to understand the design procedures and various planning matters (Athanasopoulos and Stratigea, 2015; Bakogiannis, et.al., 2017) and (c) the participation of people is an example of direct democracy that seals transparency and social consensus through a structured dialogue procedure and interaction (Kyriakidis, 2012). The methodology proposed in this paper builds up on the aforementioned literature elements focusing on noise data collection by volunteers using a specific application. The pilot testing on the methodology in the Greek cities of Kozani and Drama is later presented in detail. Considering that noise mapping is required only for major cities of each EU member country, and considering the lack of financial resources of some EU states (e.g. Greece) to meet this requirement and expand this practice to other cities (e.g. mid-sized cities), it is worthwhile questioning to what extent crowdsourcing techniques could assist in developing noise maps for mid-sized cities. Thus, the aim of this paper is to develop a methodology for noise monitoring. This methodology should be easily applicable, reliable and cost-effective. The case studies presented here focus on Greek cities, where Sustainable Urban Mobility Plans (SUMP) are implemented. The above research question is well-founded given the fact that the soundscape is essential for the promotion of integrated urban and transportation planning (e.g., reduction of noise levels in areas where it is particularly intense). Moreover, soundscape could be used as an indicator for the SUMP by comparing the previous to the subsequent noise levels. promote the concept of open noise data as far as concerning the studied cities, by uploading it in Open Street Map (OSM). In literature (Rodriguez-Manzo, et.al., 2015; Schulte-Fortkamp and Jordan, 2016), there are many ways for recording and mapping the cities’ soundscape. Such examples are soundwalks, sound recordings and interviews with experts and locals. However, according to current research, citizens’ participation consists of a usual process in smart cities’ projects (Poslončec-Petrić, et.al., 2016). This trend relates to the time-consuming process of traditional noise mapping as well as to the cost of its implementation. Indeed, the methodology typically used for producing strategic noise maps includes the existence of data-sets such as 3D digital ground models, city traffic models, train traffic models (in case a train station is located in the city under study) and the use of an ideal software for mapping the sound levels (Garai and Fattori, 2009). In many European cities (and in most Greek cities) there is no available data of such type and its collection is costly. According to the Report entitled “Best Practice in Strategic Noise Mapping”, developed by the subgroup END noise mapping of the CEDR Project Group Road Noise 2 (2013), the cost of noise mapping is significant; an approximate estimation of the average total cost for noise mapping per km mapped is € 604. In this research, as drafted and tested in Kozani and Drama, a new methodology was used in order to map the noise levels. 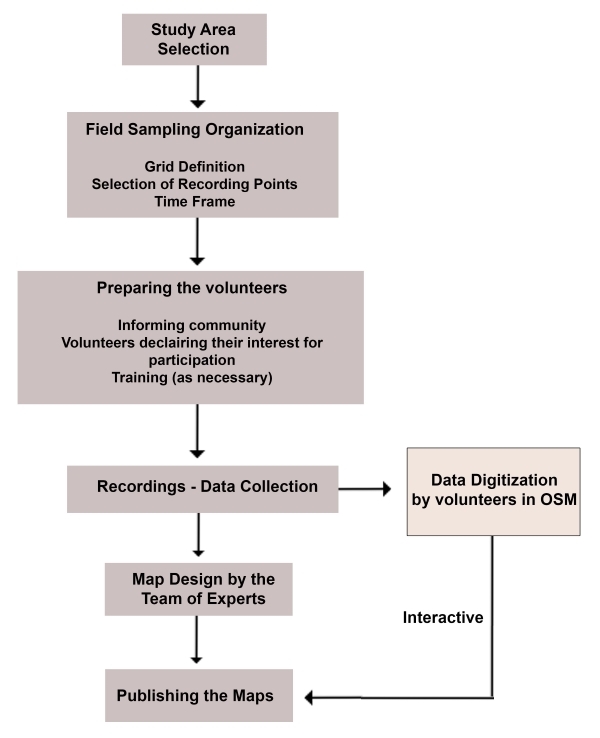 The methodology diagram is graphically presented in Figure 1, including the following steps: a) Study area selection, b) field sampling organization, c) preparing the volunteers, d) recordings- data collection, e) data digitization by volunteers in OSM, f) publishing the maps. In these steps a team of experts shall enhance the maps produced and assist volunteers in developing a readable and useful map. Although this methodology differs from the one usually preferred, however, it could be an easily applicable and cost-effective alternative for monitoring noise, mainly in small and mid-sized cities. It is also important that through importing data into OSM, it is possible to create an interactive noise map. The next step will be to put in place a dynamic map in which the data collected by the residents through their smartphones will be presented simultaneously on the map. In that way, noise will be constantly monitored and presented in the wide public. For the research in Kozani and Drama, the methodology was organized as presented below. Figure 1: Block diagram of the proposed methodology. Source: Own Elaboration. The cities chosen for this research are medium-sized cities of Greece. Kozani is located in the Region of West Macedonia, Greece; and its population is 41.066 residents (2011 census). Drama is located in the Region of Eastern Macedonia and Thrace; and its population is 44.823 residents (2011 census). The two cities were selected for this paper due to their common characteristics (e.g. population; their central districts have been developed without strict city plans over the centuries; arterial roads are passing through their central districts; their central districts display analogous land use dispersion and clustering; neither Strategic Noise Map. nor Noise Action Plans have been conducted for Kozani and Drama as they are medium-sized cities and there is no obligation to implement them, according to Dir. 2002/49/EC). The study areas in these two cities involve a number of central functions and a mix of land uses, with commercial, recreational and administrative uses being dominant. These areas are expected to present several land use conflicts due to their functional centrality and the accumulation of high people-concentration especially at peak times. Considering the above, central districts of Kozani and Drama were selected as study areas for the field research. Due to differences in the geography of these two cities, different number of recordings have been conducted in each one (Figure 2). Figure 2. 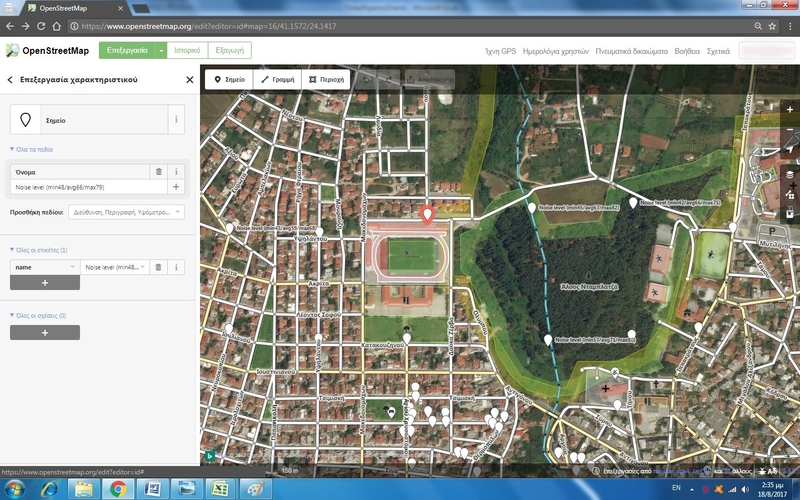 Field sampling organization: Recording points in the study areas of Kozani (left) and Drama (right). The data collection was carried out with the help of volunteers (crowdsourcing), who used their smartphones, following the paradigm of a series of similar surveys (Pödör and Révész, 2014; Garcia-Marti, 2014; Aletta, et.al., 2016). The volunteers participated in the research, upon invitation. Volunteers had no hearing or vision problems. The chosen method conforms to that of systematic sampling, where sampling points are selected using a grid for selecting points. This method was used as it adequately covers all study areas. The grid dimensions for the calculation of the points in the two cities were defined as 200 x 200 m. separating the study areas in squares of 200 m. sides, similar to the research by Margaritis et.al. (2015). The recording points were located at the center of the squares (as shown in Figure 2), whereas in cases where measurements at the designated points were not possible due to physical and/or legal restrictions (e.g., buildings, private space etc. ), closest points were selected. The duration of recordings was 3-4 hours/day. The same process was repeated every day for a week. In order to reduce faulty results, a member of the team of experts collects the data with the volunteers during the first day of recordings. Thus, it is possible to answer to any question concerning the recording process. This process consists of a pilot study. Volunteers also kept a draft calendar in which they reported the type of the sounds they heard (qualitative data) during the recording process. These data were collected in order for the SUMPs of Kozani and Drama to be implemented. Measurements were taken during both working and non-working hours. However, the analysis assessed measurements that were taken only in working hours because: (a) cities have more residents and visitors on the move during these hours, and (b) the study areas are more congested at working hours and therefore noise levels are higher. 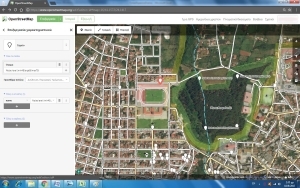 Upon completion of the field survey, the recordings were mapped using QGIS and ArcGIS software. Different software was used to produce maps in each city, as the cities were studied through different research programs. The maps produced included variables according to: (a) the average value of the recorded noise levels; (b) the minimum values; and (c) the peak values for working hours. The mapping process is usually implemented by using various interpolation techniques (Margaritis, et.al., 2015). Li and Heap (2008) present 26 interpolation techniques that are quite similar and can be performed for mapping processes. Geymen and Bostanci (2012) support that Inverse Distance Wight Method (IDW), Ordinary Kriging Method (OK) and Redial Basis Functions Method (RBF) are the three most useful methods for noise mapping, as they have selected these techniques for representation of noise values. Margaritis et.al. (2015) underline that Kriging and IDW techniques are the most widely known in the field of noise mapping. However, the literature review (Geymen and Bostanci, 2012; Aletta and Kang, 2015; Margaritis, et.al., 2015) showed that the Kriging technique is a powerful method, most frequently preferred for similar purposes. Based on the above, Kriging methodology was selected for mapping in these studies. The 2D raster surfaces were created based on the OK Method considering all the points of each study area. Adobe Photoshop CC14 was also used for improving the aesthetic of the maps. The analysis and mapping process presented above was conducted by the team of experts who were coordinating the data collection process. Finally, maps were uploaded by volunteers in the Open Street Map platform in order to provide free access information for anyone interested. Due to the fact that volunteers were people with some technical skills, not much special training was necessary. However, in case volunteers need to be trained, a short training session with instructions could be organized at the initial stage of the field research. Research limitations are mainly related to the time frame of the research. The field research has been conducted at different times for each city, as they were part of different projects with different time frames and deadlines. As for risk management, a moving vehicle could cause bodily injury and property damage to volunteers and researchers. Moreover, the volunteers had to conduct the research during spring and summer when the temperature is high and they had to be exposed in the sun for many hours a day. Although the derived noise data were collected over a one-week period in 2017 by volunteers who recorded noise at the street level, they handed in quite rational noise maps, as expected. On that basis, it could be considered that results are reliable enough to draw the conclusions presented below. Using QGIS and ArcGIS, collected data were presented as a point feature layer. In order to realize where there is a spatial relationship among the values (minimum, maximum and mid values) represented by each point feature, the OK method was used. Figures 3 and 4 depict noise maps for each city. The noise maps were developed by taking into account that mid values are the most important as they capture a more in-depth analysis by excluding extreme (min and max) values. High intensity noise was noticed in Kozani averaging from 39 to 64 dB. As seen in Figure 3b, sounds recorded in a large part of the study area are higher than 55 Db, which is the noise level defined by the World Health Organization as the limit at which people are at serious health risk. Higher intensity sounds were recorded at the northwest region of the study area, due to the following facts: (a) the existence of busy streets (i.e. Dimokratias Str., Fon Kozani Str., Paulou Mela Str., M. Alexandrou Str. ), (b) the concentration of a large number of commercial/ recreation stores and (c) administrative uses and points of high interest. Values higher than 84dB (Figure 3c) -sometimes ephemeral- were recorded in a large part of the city. This is a worrying fact, considering that the 87 dB threshold is the limit set by the Greek law (Presidential Decree 149/2006) for a maximum fixed exposure value for a worker in an 8-hour work day. Noise levels are relatively high, even in the case of the minimum values (30dB)​​ recorded (Figure 3a), given the fact that levels higher than 23 dB can cause problems in the understanding of speech and thus the communication of people (Anon, n.r.). The intensity of the recorded sounds is higher in the northwest side of the study area, where the concentration of commercial/ recreational land uses is higher, and therefore the higher number of daily discussions is held, especially during working days and hours. The north-western part of the study area shows small fluctuations, as shown in Figures 3a-3c. Recorded sounds are mostly high during working hours (Figures 3a-3c). Minor fluctuations in sound intensity are also recorded in areas located in the east of the study area. St. George’s area, the University of West Macedonia campus area and spaces around OSE (inactive train station) are the quietest areas throughout the study area. Noise levels are a significant parameter of the urban environment. 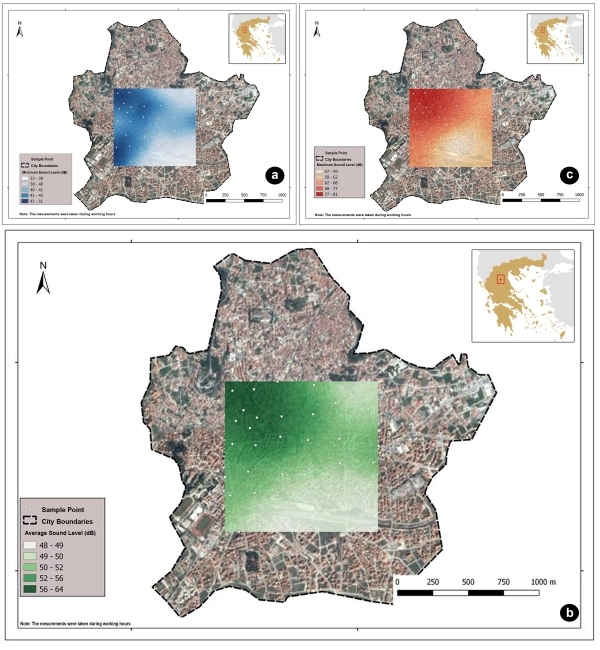 In the case of Kozani this is quite evident while observing the noise maps for the semi- pedestrianized city center where the smallest range of peak sound levels is observed, as opposed to the areas near major streets where larger peak sound levels are observed. The 87dB threshold for the continuous 8-hour exposure, as set out in the Greek Legal Framework, is surpassed in much of the city center study area, even momentarily. Noise levels in central areas exceed the sound level of 41dB that allows people to communicate properly. As shown in Figure 4a there is no recording of less than 41 dB. The area around the OSE (inactive train station) appears to have low noise levels, although adverse results were expected. The local maximum levels are lower than those recorded at the city centre, while the overall highest in the area are relatively low. In overall there are small fluctuations observed in the area. As previously noted, the urban environment is significantly associated with noise levels. This is quite obvious in the case of Agia Varvara park, which seems to function as a sound fence for its surroundings. The recorded average high and low sound levels in the vicinity of the park are significantly lower than those recorded throughout the city. Summarizing the above, both cities encounter issues in terms of noise pollution. Pollution is higher in the city of Drama although there are larger green areas and measurements were taken in the summer period. The greater extent of urban morphology in Kozani, along with the latest pedestrianization projects in the city centre, appear to be the two key elements contributing to the maintenance of lower noise levels. As mentioned before, noise data for these two cities is now available through OSM. Figures 5 and 6 present a part of each city map in OSM, where the noise recordings are presented. Data were digitized by the volunteers who were not trained due to the fact that they were already familiar with the OSM. Instructions about the recording process have been given and a pilot study was also implemented. It should be mentioned that in case volunteers need to be trained, a short training session could be organized, as Figure 1 presents. Noise mapping is a strategy established for monitoring noise levels and protecting human health. Indeed, the European Directive 2002/49/EC proposed plans and maps which had to be implemented for specific cities and transport infrastructures. Through this Directive, a detailed methodology is proposed in which specific indicators should be used. Although the results of this method are accurate, however, this is a time-consuming and costly method. Thus, it is not possible to be applied in medium and small sized cities for which the compilation of noise studies is not compulsory by the law. In these cases, citizen participation may help in the collection and publishing of the needed data. In cases of Kozani and Drama, the above methodology was applied. Three volunteers from each city participated in this project. They collected noise data for one week in each city by using their smartphones. More specifically, they have used one free smart phone application, named Sound Meter. These data are differentiated from the data that should be collected according to the Directive 2002/49/EC because: (a) they were collected at the street level, while the Directive imposed that the recording should take place in the height of 4 meters and (b) recordings lasted for approximately 3-4 hours/day while the Directive imposed that the recording should take place 24 hours/day. The first issue should be further examined in order to adjust the proposed limits of noise exposure taking into account the height in which the recording are conducted. The second issue can be faced by attracting volunteers in large numbers with various motivations. The more people participate, the more recordings will be implemented. However, taking into account the fact that there is no available data for many Greek cities, satisfactory information is provided through this methodology that can be helpful for researchers in order to understand the soundscape of each city. This has become obvious through the case studies presented above. Through this methodology transport engineers, planners, decision makers and citizens can understand how important it is to use sustainable means of urban transport and to minimize road asphalt surfaces within city centers. 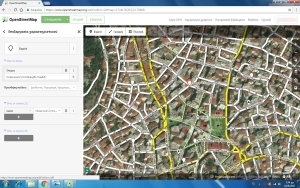 Indeed, through noise mapping in Kozani and Drama, results showed that the street pattern (morphology, geometric characteristics, land use, etc) is related to its soundscape. More specifically, it was evident that in semi-pedestrianized areas, the noise levels were lower while the opposite was observed in areas where roads with a high traffic load are located. Bakogiannis Efthimios is a surveyor (Und. Dipl, NTUA) and he has a Ph.D. in urban and transportation planning (Ph.D.). He is a member in the Sustainable Mobility Unit and he is an active practitioner in the fields of urban and transportation planning. Charalampos Kyriakidis is an Urban Planner (Und. Dipl., University of Thessaly – M.Sc. UCL). He is conducting a Ph.D. research in the field of urban design and planning in the Department of Geography and Regional Planning in NTUA. He is a member in the Sustainable Mobility Unit and he is an active practitioner in the fields of his expertise. Maria Siti is a surveyor (Und. Dipl, NTUA – M.Sc. Un. of Strathclyde). She is conducting a Ph.D. research in the field of urban planning in the Department of Geography and Regional Planning in NTUA. She is a member in the Sustainable Mobility Unit and she is an active practitioner in the fields of surveying engineering and urban planning. Nikolaos Kougioumtzidis is an undergraduate student in the School of Rural and Surveying Engineering, NTUA. Chryssy Potsiou is a Professor at NTUA. She has 30 years experience in education, training and research. Since 1982 she is active in the International Federation of Surveyors (FIG) and currently she is the President of FIG. She has organized several international conferences. She has been contributor, co-author or main author of many publications and has written more than 110 scientific papers.